Click here more details on Fave Five. Chew on This, by Eric Schlosser Back in my magazine editing days, I used to work on a column called “What the Writers are Reading,” and we were lucky enough to feature Michael Pollan in one of them. One of the books he recommended for kids was Chew on This, which is Eric Schlosser’s children’s version of Fast Food Nation. It’s been shortened a bit and the tone is a little more kid-friendly, but the effect is the same as it is for adults: When 9-year-old Phoebe found it in my shelf and devoured it, she said she would never walk in to McDonald’s — or eat any fast food — ever again. If I was a better mom, I might have waited for her to turn 12 (which is the recommended age) before handing it to her — there is a story about a six-year-old who dies from E.Coli and graphic description of animal cruelty that upset her briefly. But only briefly. She’s read it three times since. 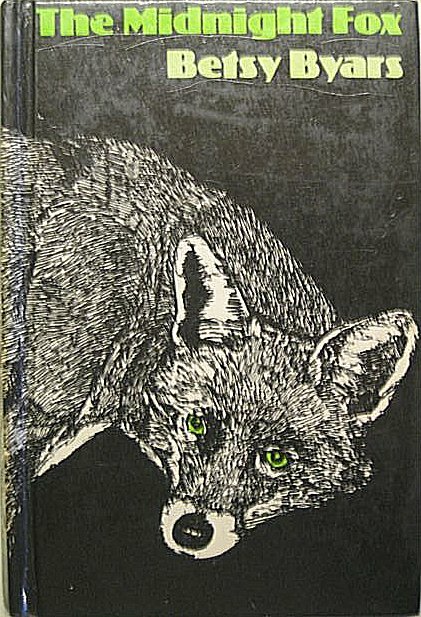 The Midnight Fox, by Betsy Byars. Gretchen was the one who recommended this as part of her kid lit program and I am embarrassed to say that before then I had never heard of Betsy Byars (even her more well-known Newbery-winning Summer of the Swans). We intend to change that over the next few months, because this was the kind of chapter book that is so tight and so simply written, you finish it and say “I could write a book like that.” (Of course, by now we know there is a converse relationship between how effortless a book reads and how hard the book was to write.) This beautiful chapter book is told from the point-of-view of Tom, a 10- or 11-year-old whose parents send him against his will to spend the summer at his aunt’s and uncle’s farm while they travel to Europe. Tom, whose idea of fun is building model airplanes and spying on hornet’s nests at his best friend Petie’s house, is not happy about the set-up until, on a lonely exploratory walk through the woods, spies a black fox. He spends his summer observing and eventually protecting the fox and in the process learns a little something about himself and life, including this little gem: That sometimes your parents are right. Ages 8-10. 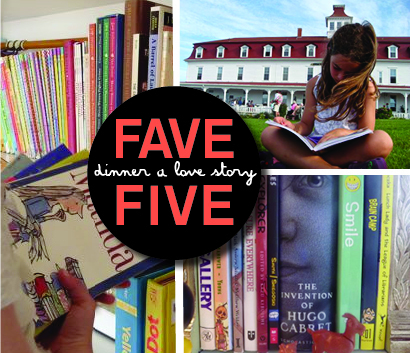 “Fave Five” logo by Robin Helman. Publishers interested in submitting to Fave Five. Please contact Jenny AT dinneralovestory DOT com. LOVE the Great Pie Robbery!! When we had it checked out from the library, we read it EVERY SINGLE DAY for about a month, no joke. Kids just adore this book, it’s so silly and fun! Sigh. I have the same problem with my kids’ books — they are now 16, 13 and 10 — I can hardly bear to part with any of the books we’ve accumulated over all these years. I admire your strength in giving them away. My son is 3 and reads his books to me now. I tear up every time he reads me “The Very Hungry Caterpillar” and “How Do Dinosaurs Love Their Dogs”. My 6 year old daughter is blazing through The Magic Treehouse series. I don’t know what I’ll do when it comes time to pack them up. Sigh. I adore Marla Frazee – Roller Coaster and Santa Claus, the World’s #1 Toy Expert are joy-filled and fun. When I rule the world (could happen), the universe will supply every child with Everywhere Babies on his or her 1st birthday. Sadly, now that my son is 9, I can’t even look at the cover with welling up. The same can be said for Richard Scarry’s Cars and Trucks and Things That Go. Oh, Mistress Mouse and her tow truck, I miss you! We have a whole shelf of Grace’s books from ages 10 months to present. These are the books that she and I agreed we’ll never get rid of–Good-Night Moon, Mooses Come Walking (by Arlo Guthrie! ), Happy Birthday Moon, Imogene’s Antlers– some because we love them so much, some because someone special gave them to her. We’ll save them for her kids, and in the meantime… well, just tonight I found Grace reading Harold and the Purple Crayon before she turned back to the one of the Narnia series. I love kiddie lit but gravitate to what I knew as a child, so really appreciate learning what’s hot on DALS’ bookshelves. My mom kept many of my books, and it’s so great to go back home and find my childhood on a shelf: yellowed Trixie Beldons next to E.B. White and the Noel Streatfield books. I just added all five of these to my amazon shopping cart. I love this new feature! Please keep doing it! I love this aspect of your blog! I just started working as a children’s librarian and now I get great suggestions for what to purchase at work as well as what to cook when I get home. We played this album over and over, and we all loved it. Thank you for posting this and all of your other book recommendations. I always turn to your site for gift ideas for my nieces and nephews (they know that I only give books, not toys), and so far, all of your books have been a hit. Please keep updating the Fave Five. P.S. I hope your “application” for chocolate pudding pie is accepted. The Frances books are my very favorite books to read to 4-6 year-olds. Bedtime for Frances and Bread and Jam for Frances are the best of them. So glad you honored Mr. Hoban! Love Bread & Jam for Frances. A bargain for Frances is also hilarious. That Thelma! My favorite part to read from Bread and Jam is when Father says how handsome a veal cutlet looks on a plate. Oh, and describing Albert’s lunch, and his perfect line at the end: I think eating is nice. Thank you for these lovely suggestions, and for all the dinner time inspiration. We must be the only family in America adding meat to our diets right now, and as a former vegetarian I can be a little skittish about cooking it – so I often come here for help and guidance. You all never let me down. Thanks. Ohhh, Bread & Jam. How I loved that book. I’m so excited to start collecting books for our little one’s library when he arrives in June. These might be my favorite of your posts! We love Paper Bag Princess here! (ages 4 3/4 & 2 1/2). Mommy loves the stories where princesses save themselves. Can’t wait for the book. I had never read the Paper Bag Princess until a couple years ago when we checked it out at the library. I was reading aloud…lalalala…not paying a whole ton of attention myself…yaddayaddayadda…expecting a typical princess story and when we got the last page I cracked up laughing. So unexpected and delightful. My daughters said, “well, that was weird!” but it simply killed me and is now one of my favorites. P.S. Your security questions keep getting harder on me…10+15? Really? If they move onto algebra, I’m gonna have to limit myself to lurking. love, love, love van gogh cafe. you could read it in about 30 minutes, and it would be well worth the time. Can’t wait to read the paper bag princess! Thank you for continuing to inspire our family to eat together, play together, and read together! I think you should try out the Chet Gecko series. It’s about a 4th grade gecko detective and his bird assistant, Natalie Attired and is a pretty terrific send up of 1940s film noir. It’s inspired my nine-year-old son to war fedoras, make up business card and call women dames. Great list! But, honestly, you can’t go wrong with Cynthia Rylant (or Cynthia Rowley, for that matter). Everything she writes has heart and humor in it. Don’t miss her Poppleton series – my family loves them all. Oh, and her books Cat Heaven and Dog Heaven are great if you or someone you know has lost a pet. Oooohhh. We named our daughter Clara after The Van Gogh Cafe. It is the loveliest book and I was so tickled to see it on your list. It’s not well known even though it’s by Cynthia Rylant, and I’m happy to see it’s one of your tops. Have you gotten around to reading it yet?